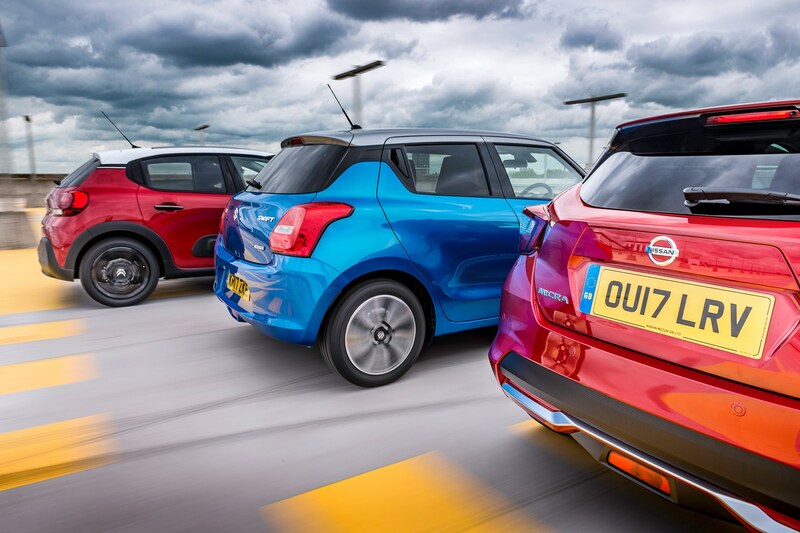 ► Which new supermini impresses most? From zero to minor hero and back again – in almost 35 years of trying, the Nissan Micra hasn’t always merited mention in the same breath as the big hitters in the supermini sector. There was a European Car of the Year win in ’93, and the early-noughties iteration was a genuine highlight. But the last version, clearly built for the Asian market and foisted upon us Europeans rather than designed and engineered here like Nissan’s most successful cars, was so sub-par we barely wasted our breath on it at all. Except to occasionally mutter about how much better the Fiesta and Fabia were. 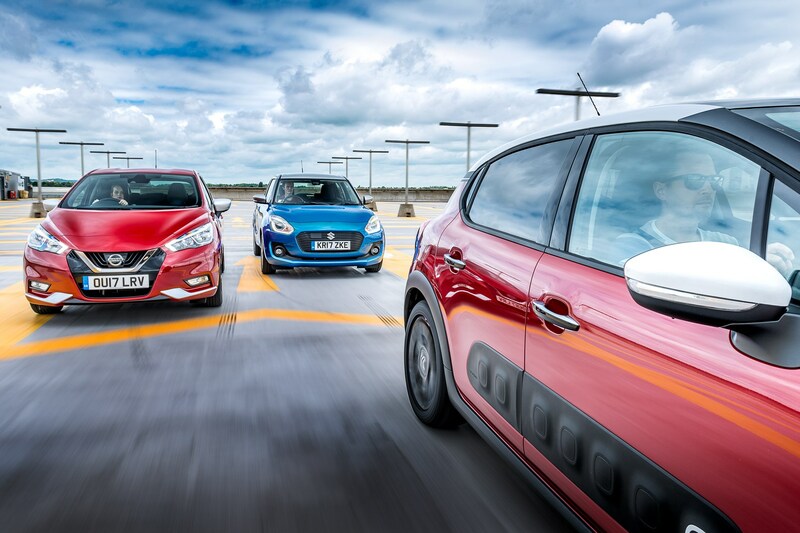 But this time Nissan is serious about superminis. And given the runaway success of the Juke and Qashqai, two cars that revolutionised the bread and butter family market, you’d credit Nissan circa 2017 with a good nose for what people want. So we’re told the new Micra (above) is better to drive. We can see it’s better to look at, and feel that it’s built of tougher stuff. Or softer stuff, if we’re talking about the new interior. But is that enough? Ford’s new Fiesta might be the sternest test, but first the Micra needs to prove it’s earned a shot at that bout by dismissing two other key rivals. 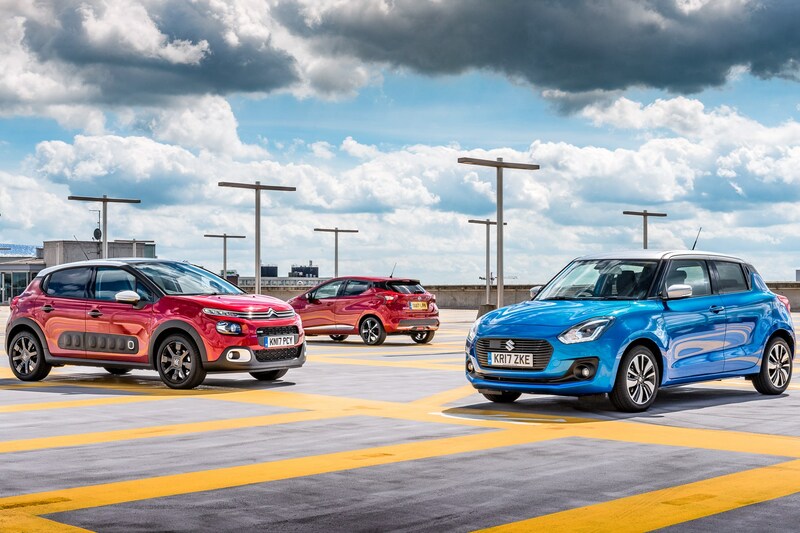 One is the C3, the latest supermini from a company that’s also rediscovered its mojo and shows no sign of letting it go. The C3’s designers have had a proper party translating the ‘what if?’ thinking behind the C4 Cactus into a small car market that’s blighted by too many bland-looking me-too competitors. Suzuki too, is on a bit of roll. The last Swift was a secret success by bit-player standards, never bothering the big Europeans at the top of the sales charts but still finding over a million homes across the continent in a decade. The new one promises to be even better. Almost as light as an ’80s hatch – swoon – and with the option of a clever new hybrid system, this is a Swift that could finally make the mainstream brands, and you, take it seriously. But will you notice that’s it’s a new Swift? Apart from the fact that there seems to be a Jaguar F-Type escaping from the front bumper, the styling isn’t radically innovative. But with its kicked-up waistline at the C-pillar, a design cue that must be mandated by the EU commission it’s so prevalent these days, and its contrast colour roof, it’s fun in a restrained VW-group kind of way. But not a Citroën kind of way. The C3 proves that great things can happen if you buck convention, forget what the competition is doing – and quite possibly have a water pipe instead of a water cooler in your design department. From the Airbump cladding on its doors to the way the double-chevron motif that makes up the grille blends seamlessly into the headlamps, the Citroën is effortlessly cool. And cool without taking itself too seriously, or falling into the trap of trying to sell dynamism, which is the Micra all over. Nissan has gone for edgy and grown-up. It looks like a shrunken, sportier Leaf. Not bad exactly, but still bland. 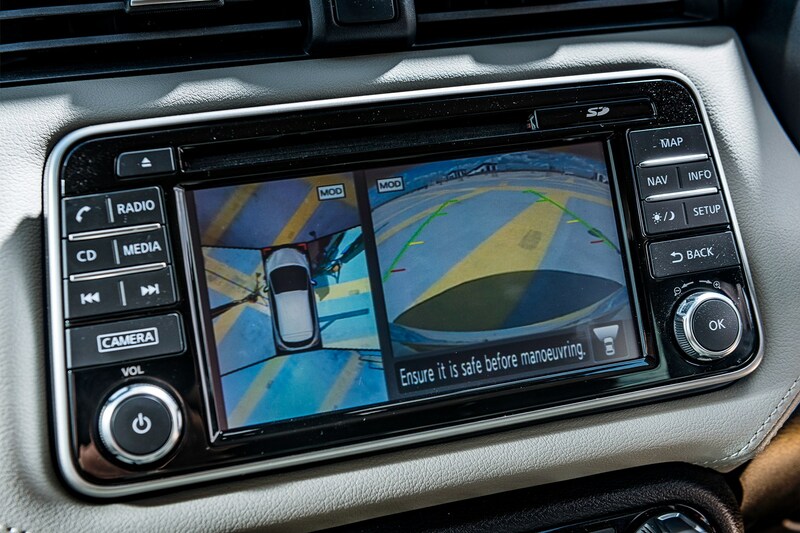 It’s the same story inside the new Micra (above). 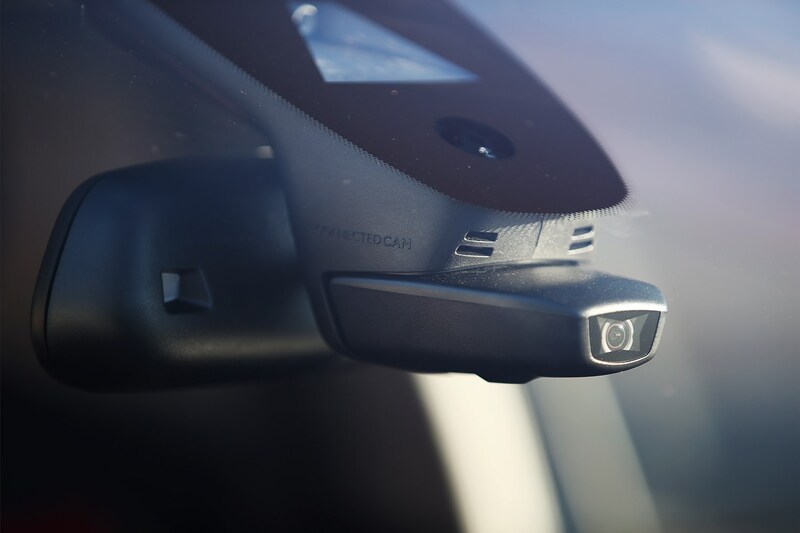 There’s a big-car feel and big-car materials, an ideal driving position and a sat-nav system that has sensible twisty dials to supplement the touchscreen. But the seats are as cushioned as concrete, and if this cabin isn’t totally bereft of wow, it never goes out on a limb to knock you out. The dials are dull, and there’s little to suggest an identity here. That’s not something you could level at the C3 (below). Remember when Citroën interiors were built like a playing car pyramid? Maybe they’re not built like an Audi these days, but it’s good enough, and the design carries it the rest of the way: the contrasting colour in the door pockets, the leather-look door pull-strap, the Airbump motif replicated in the air vents and door panels. Everywhere your eyes come to rest they find some detail worth lingering over. And it’s not all design at the expense of real-world usability. 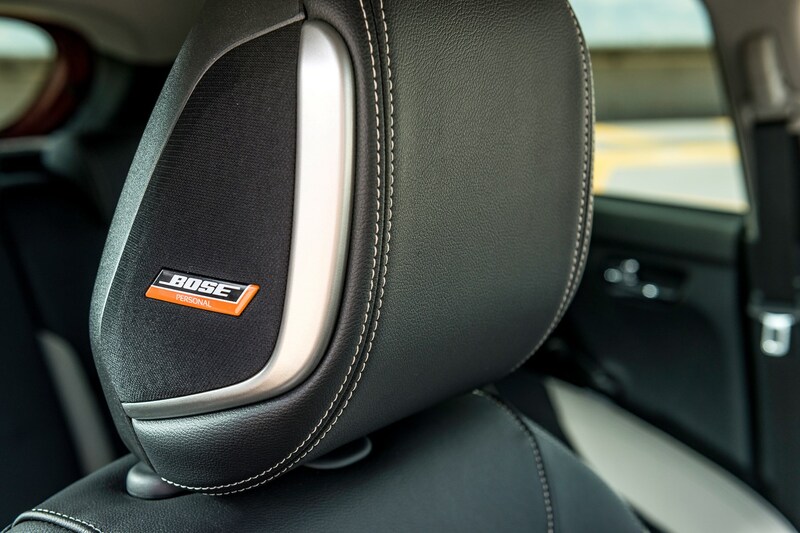 The seats aren’t just handsome, they’re brilliantly comfortable too, and there’s plenty of storage for phones and wallets. Suzuki’s about as well known for its interiors as the people who make film-set street facades, and the Swift (below) can’t help but fall down in the face of the C3’s confidence. No, it can’t match the Citroën for character, but it’s handsome and the controls are straightforward to operate. But Suzuki needs to make the same step forward in material quality that Citroën has. There’s too much hard shiny plastic in the Swift and the graphics on the touchscreen display lag behind the best European kit. But then look how much cheaper it is to buy. The base £10,999 Swift SZ3 is powered by an 89bhp 1.2-litre four that gets it to 62mph in 11.9sec. 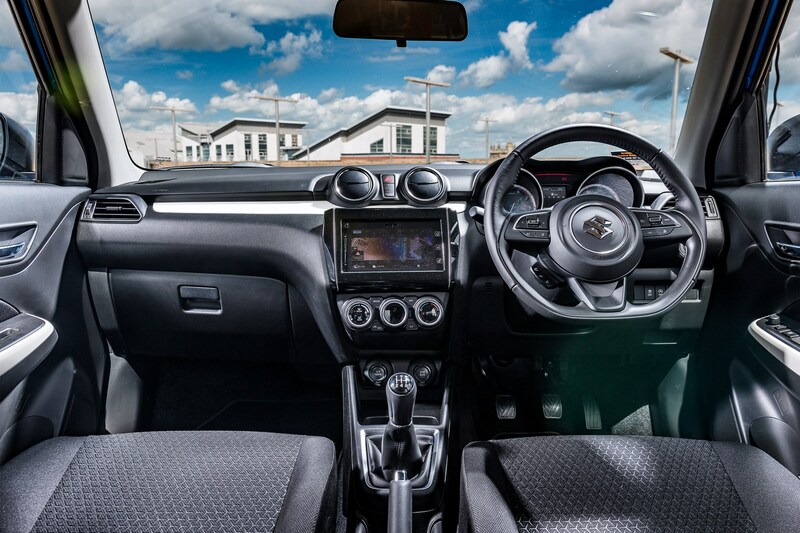 Standard kit includes air conditioning, a leather-wrapped wheel, DAB radio and Bluetooth. Unless you’re going to be pounding the motorway and need more muscle, that looks like a strong deal. You’ll need another grand to get into the cheapest Micra and boy will you know you’re on the bottom rung: there’ll be no air-con to keep your hands cool as they grip the nasty plastic wheel, and only an asthmatic naturally aspirated 70bhp 1.0 petrol under your right foot that takes a yawning 16.4sec to get to 62mph. Never mind whether the Micra’s a match for the next Fiesta. The entry-level Micra would get smoked by a 40-year-old Ford. 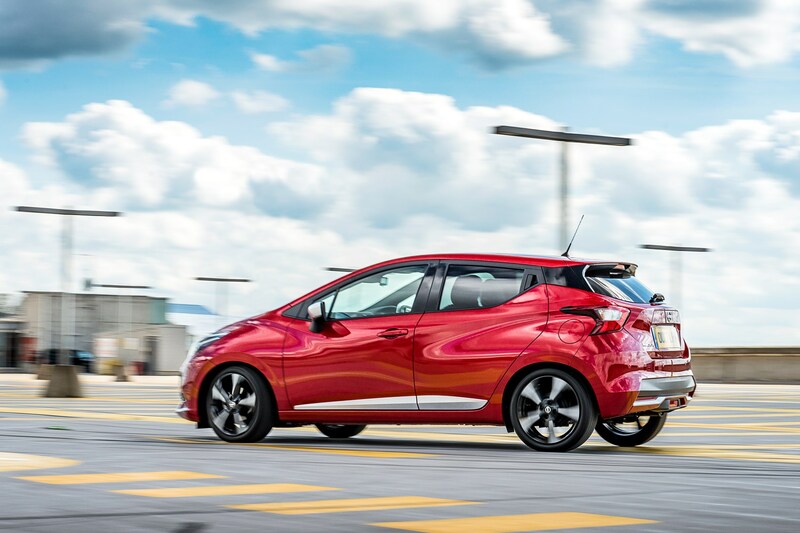 The basic C3 Touch has even less power – just 67bhp – but still manages to take almost 2.5sec out of the Micra to 62mph. At £11,135 it’s close to the Swift on price, but not on spec. 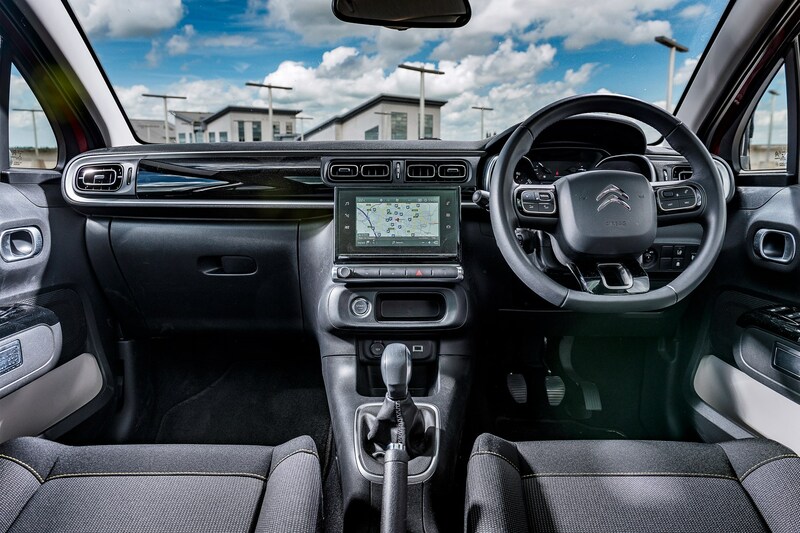 There’s no air-con, electric windows or Bluetooth media streaming down at the foothills, so you’re buying the C3 for its quirky design. Or at least you’d think you would be, but even the funky Airbumps are absent on lower trim grades. The version you see here, on the other hand, has the lot. It’s our long-term test car, powered by the top-of-the-range 109bhp turbocharged triple that only comes with fanciest Flair trim, and left the showroom costing £16,285. Or it would have done if it hadn’t been loaded with almost £2k of options before it got there. The Micra is similarly showy. Seen here in bells ’n’ whistles Tekna spec at £17,435, it’s fitted with an 89bhp turbocharged triple, the only engine alternative to that base 70bhp slug if you want respectable performance and don’t want the 1.5dCi diesel. And in light of those numbers the Swift looks very good value indeed. For two grand over the £11k base price you can swap the atmo 1.2 for a turbo’d 1.0-litre triple that nets you 21bhp more and whittles the 0-62mph time down to 10.6sec. Or for another £1500 on top of that you can add Suzuki’s SHVS mild hybrid system, which is what we’ve got here. Basically a combined starter/generator system, it’s not capable of powering the Swift solely from its additional lithium battery, but can assist the petrol engine enough to help it duck below 100g/km CO2 compared with 104g/km for the non-hybrid car. SHVS costs £1500 because it requires a move up from SZ-T trim to SZ5, which comes with goodies like 16in alloys, navigation, forward detection, keyless entry and electric rear windows. Suzuki doesn’t promise any huge performance improvement – the figures say it’s no quicker than the non-hybrid version, and with only a 2.7bhp boost available for brief periods under hard acceleration, that seems entirely right. We’d have to drive hybrid and non-hybrid versions back to back to know whether you can really feel much difference at all, but we can tell you that this drivetrain is a riot. The Suzuki’s not the quickest car here, though – that’s the Citroën, which storms away when the road opens up thanks to its thumping 151lb ft of torque. The C3 reaches 62mph in a rapid 8.9sec, the sloppy pitch control sending the nose down and then skyward as you dip out of the power to make each of the upshifts in its five-speed ’box. It’s a pretty vocal engine, but that’s okay because the three-cylinder rumble is a welcome companion. Turbo lag, less so. There’s a noticeable delay coming off the gas and back on again that you don’t get with the Swift, which is supposedly 1.6sec slower than the C3 to 62mph, but doesn’t feel it on the road. True, it doesn’t have the on-boost kick of the C3, but the Swift’s is a more rounded drivetrain overall, picking up eagerly from low to mid revs then piling them on with a manic cackle until the fun tails off at 5500rpm, some 800rpm short of the misleading red zone on the rev counter. And while it might be down 26lb ft of torque on the C3, the Swift has another trick up its sleeve besides the hybrid system. Dig into the Swift’s technical make-up and you can see where the slush-moulding fund got diverted. By focusing on its choice of metal materials instead of dashboard materials, and shrinking the Swift’s footprint slightly, Suzuki has lopped a massive 120kg off its kerbweight. The now five-door-only Swift, complete with six airbags, air conditioning and ABS, weighs 890kg, a figure that would have looked competitive 20 years ago when small cars had none of that stuff. The most featherweight of the current Lotus Elise range is just 30kg lighter. What was it Colin Chapman said? Adding power makes you faster on the straights. Subtracting weight makes you faster everywhere. The Swift fizzes with life, feeling alert in the way light cars do. Despite wearing 185-section tyres to the 205s on the other pair, it responds smartly to orders barked through the wheel and doesn’t get flustered by the kind of sudden direction changes you have to make in a city when dodging traffic or sprinting round a corner to catch the green light. It’s no benchmark for steering feel or body control. We’ll be surprised if the next Fiesta isn’t even better to drive, and disappointed if it isn’t more refined. But the Swift is simple, unpretentious fun to hurl about and leaves the C3 in its wake down any B-road. It’s great to see Citroën embracing the art of the lope instead of getting sucked into the ‘sporty’ hole that all car makers have been forced to throw themselves down in recent years, urged on by marketing types convinced only fast can be cool. But having said that, there’s a basic level of steering precision and body control that cars need to display, not only to feel fun when going fast,but also to feel relaxing when they’re travelling even moderately quickly, and the C3 doesn’t have it. Tracking a line along a flowing A-road demands too much attention. And if you do enjoy squirting down the odd country lane, or even getting energetic through town, you’re better off shopping elsewhere. And what of the Micra? There’s some good news. The body control is strong, giving the front end a planted feel as you flick it into corners, and the gearchange is probably the best here. But the ride is jittery and, while it revs out long after the Swift’s has called it a day, the engine is awful. It’s not merely that it’s less punchy than the others. At idle the tiny 898cc triple sends annoying vibrations through the cabin, and then when you’re rolling it hangs onto revs like there’s a lump of lead the size of a cheese wheel clagged on the end of the crank. If that’s annoying when it comes to timing that first to second shift, it has a perfect partner in the weird whiny zing sound the engine emits when it’s working hard. Still, since the back seats are too small to be fit for human habitation you could always fill the space with foam to try to dampen the din. 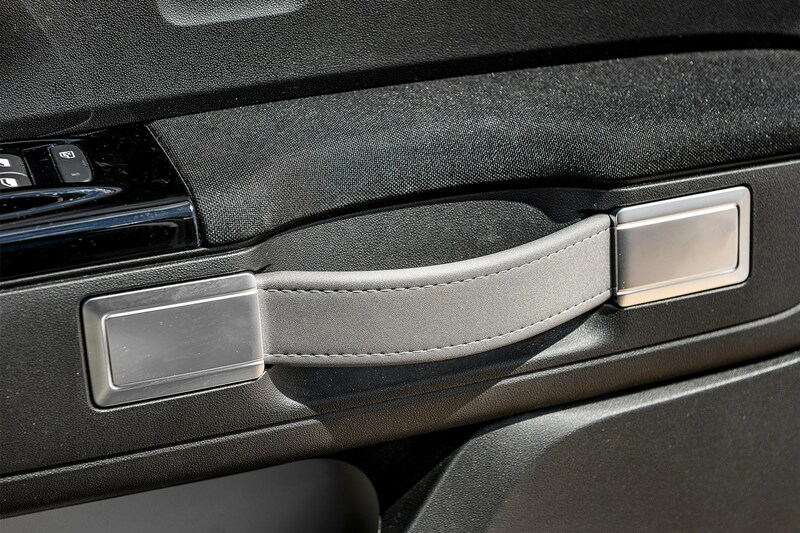 It seems like Nissan has thrown all its effort into keeping the driver happy with the smart dash plastics and Bose headrest speakers, and everybody aft of that headrest can go swing. Even modestly sized adults and older teens will find their heads brushing the headliner, and ducking under the cant rail to get out feels like climbing out of a tent. The Citroën fares slightly better, and the middling rear headroom would be better without our car’s optional full-length glass roof. But it falls to the Suzuki, the shortest and narrowest of these cars, to provide the best rear room by a wide margin. Thank the sensible high roof for that. It’s not all gleeful middle fingers from the Swift, though. Suzuki increased the boot capacity from a city car-like 211 litres to 265 litres for the latest Swift, but that’s still some way off the 300 litres offered by the Micra and C3, never mind the 330 litres of the Fabia. But that’s a small victory for the Nissan. Forget the hype: if the Micra is a step forward for Nissan superminis it’s one of those small shuffling ones people make when they’re close to departing this mortal coil. Certainly we can imagine it finding friends with its grown-up look, mature big-car interior, the planted feel of the chassis and its impressive array of standard safety kit. But it’s slow, expensive, not that great to drive and the rear packaging is a joke. Worst of all, it feels like it’s trying so hard to demonstrate some kind – any kind – of personality, but it turns out it doesn’t really have one. 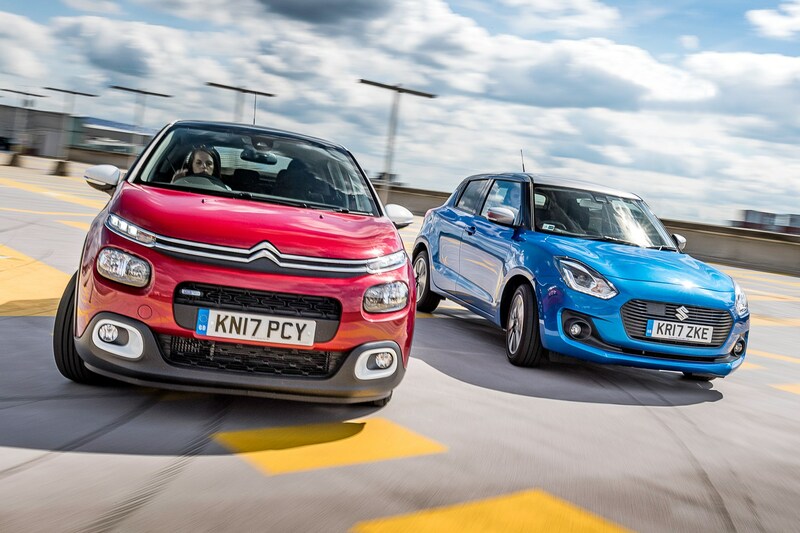 The C3, on the other hand, is bursting with personality, and it’s all down to Citroën’s brilliance at democratising style. The C3’s feelgood factor is off the chart because everything you look at is interesting and has been thought out. And that means the C3 is that rare thing, a small car with a real identity. Despite sharing mechanical parts with Peugeot siblings, this could only be a Citroën, just like Citroën’s iconic cars from the ’50s and ’60s. Unfortunately the C3 seems to be channelling the chassis dynamics from that period too. 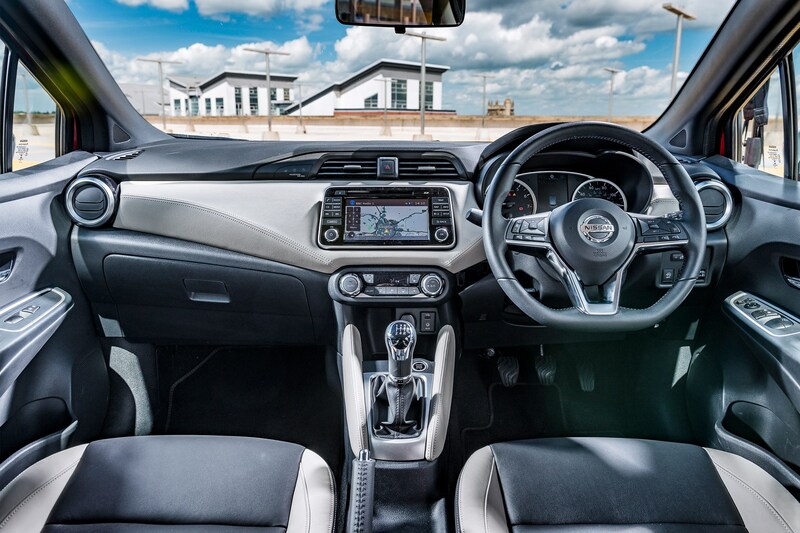 The 110 engine is excellent – far faster than the Micra’s but matching its 61mpg – but the steering and body control mean its not much fun to drive, and like the Micra, space is tight in the back. Which brings us to the Swift. It isn’t perfect. The interior feels a bit cheap, but then this is a cheap car in relative terms. Cheap and so bloody cheerful that Micra probably wants to knock its teeth out for photo-bombing its comeback party. Well, good luck trying to catch it. From the zip of the turbocharged triple to the pointy handling, the Swift is brilliant fun. The hybrid system is clever but now that the road tax system no longer favours cars below 100g/km CO2 it’s unlikely to work out cheaper. So stick with the non-hybrid Boosterjet turbo triple or keep it lean with the basic £11k 1.2. But whichever Swift you go for you’ll be buying the car that represents the best value, delivers the most interior space and puts the biggest smile on your face. Cheapest, best equipped, fastest and most fun to drive, the Swift is a comfortable winner. Another genuinely desirable Citroen. Just needs more rear space and sharper handling to be a front-runner. Nice finish but slow, expensive and criminally small in the back. New Micra makes too many old mistakes.